Mid Century Modern Style Lighting Replacement Lampshade for Neckless Mid Century Modern Style Light Pendants as shown in last photo. 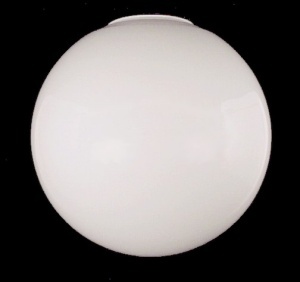 Blown White Milk glass, Ball shape, flame polished Neckless rim. Indented Area around the Opening: 6 1/4 inches W.
Fitter Opening: 4 1/4 inches W.
Gently Used. No chips, cracks or noticed scratches. Possible minuscule signs of use. Price is for one Shade only.